My friend LindaH is so smart. She posted her Canada Day Project earlier this week. 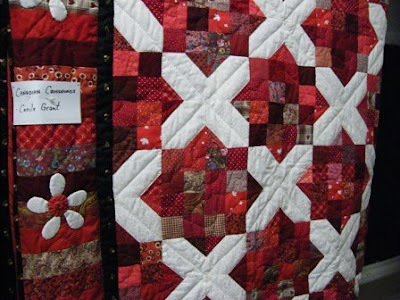 It's a sweet Maple Leaf quilt that she'll use as a place to hang her pins collected from various quilt guilds. Go over and have a look at her Maple Leaf post. I have been working on some fun projects for my niece's upcoming wedding so I can't post pictures, but the projects have been all fun. I'm doing some final hand hemming of some little dresses etc but other than that, my wedding sewing projects are coming to an end. It was fun while it lasted. So what's next for me? Since it's Canada day tomorrow and we'll be heading to the cottage for a day or 2 of long overdue sunshine. 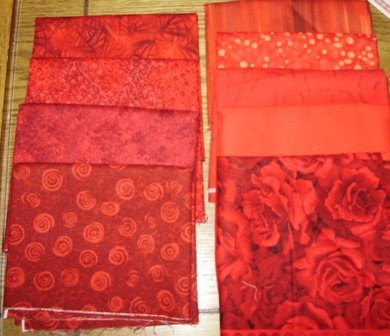 So for now I thought I'd show you some red fabrics that I've been collecting from shops all over the Maritimes. 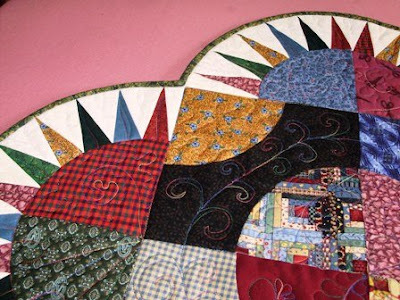 I fell in love with Alex Anderson's quilt from her book Finish It. 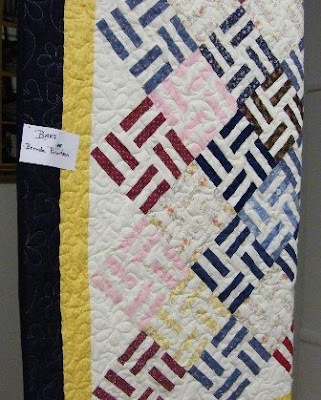 I saw this quilt in person when I attended the Ricky Tims seminars in Ocala FL this spring. Of course, there's not only reds, but I had none at all in my stash. So now I have enough reds and with the stash fabrics, I'm ready to start some cutting. I plan to start sewing this in the fall. Maybe next Canada Day, I'll show you my nice red quilt. Happy Canada Day Everyone! Back in a few days. 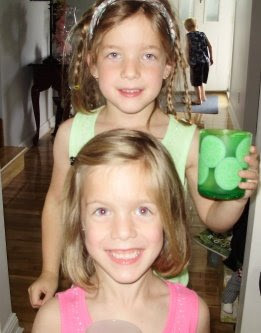 This is Jessica and Emily. Our Number one and two grandchildren. 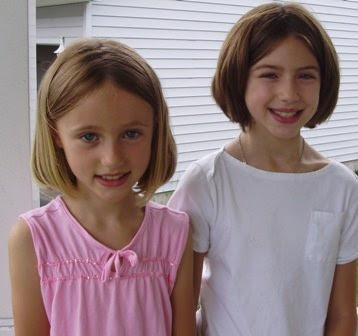 Sporting their shorter summer haircuts, they came for a visit on my birthday. They're now in Niagara Falls enjoying one of the great natural wonders of the world. I visited Niagara for the first time only a few years ago, and I wished I had seen it long ago. These kids are so lucky to see it when they're young. They'll hear about it in school, see documentaries of people going over it in barrels and hear of people's visits to this great place. Aurora came for a weekend stay as well. She's now giving hi 5's and has taken a liking to stuffed animals. This weekend, this Christmas dog was her favorite. 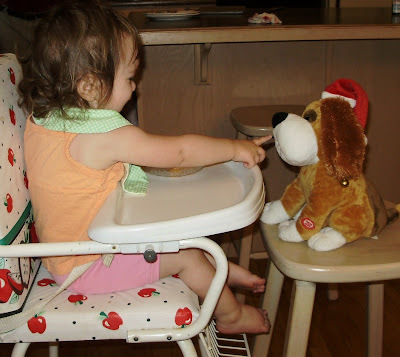 She likes to talk to him while having her snack. It's fun to watch that little brain of her's clue in to games and playing. She's such a cutie. The triplets are are gone to PEI for a vacation. I love Ann's land. Home of Ann of Green Gables that is. Last year, all the kids went to the Haunted House. They were all scared out of their wits. But they've been talking about the haunted house ever since, so it was memorable. They say they're going back because if they happen to have a rainy day because now they're bigger and they're not scared. We'll see! And the rain continues in the east, so with an empty house, and no sun today, it's off to the gym and then into my sewing room. I wonder what I'll make today. I had started this post yesterday but it was such a busy day yesterday, that I didn't have a spare minute to finalize it. Yes, it was my birthday. What could be better than having a visit from all the people you love so much. All my kids and grand kids were here throughout the day to bring gifts and well wishes. I love my birthday and when everyone comes around to share it with me, I feel so special. Last week I received a great birthday gift from Friday Girl Vivian on behalf of the coffee girls. It was a fun, fun cupcake themed bag of goodies. The Martha Stewart Cupcake book has hundreds of recipes and pictures that are so inspiring. It's hard to decide which one to make first. Yesterday, knowing that I was going to have lots of visitors I got to try out a few of the cupcake things in my gift bag. See what I made. How fun is it with the kids around when they saw them. WOW was their reaction. 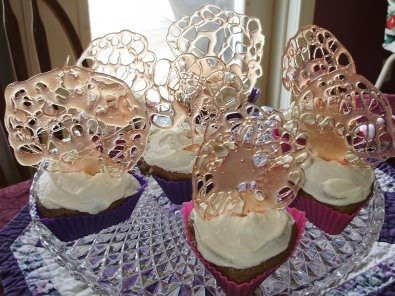 The lacy tops were made by boiling sugar syrup to the crack stage then drizzling out on parchment paper. You have to remember to drizzle a stick so you can actually stick the creation in the cupcake. The next time the kids come over, they can pick out their own special cupcake recipe and we can make and decorate them. 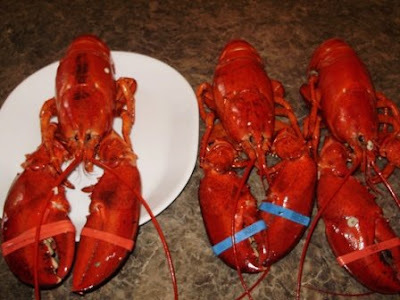 For my birthday supper, my hubby bought the biggest lobsters we've ever had. They each weighed about 2-1/2 pounds. They didn't even fit on the platters. No problemo, we broke off the claws and then they fit. We had them with coleslaw and potato salad. They were delicious and of course we have leftovers for a nice toasted lobster roll today and probably enough for a supper too. I loved my birthday day. I took my first yoga class at the gym yesterday. I quite enjoyed it and I've been needing to add some stretching and flexibility movements to my exercise program. 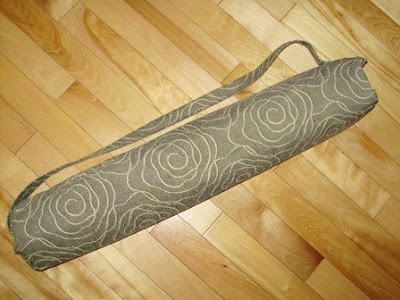 I now know why one would need a bag to carry their yoga mat in. It's the most awkward thing to carry around in your car without unravelling. This morning, I made this one up as a prototype. I looked at a few tutorials like this one, and this one by Amy Butler. But I didn't really want to fuss with a circular seam at the bottom. 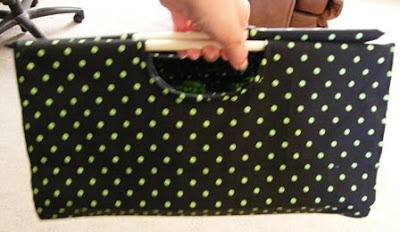 I did get the idea that the bottom of the bag doesn't need to be round from this tutorial. So armed with ideas, in less than half an hour, I made this prototype bag with folded corners and an open top. I'll use it for the next few times I go to yoga class. If I feel I need a few pockets, I can use Amy Butler's technique to add them. 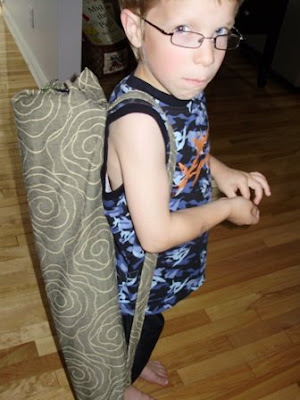 Here is Mitchell modelling how my yoga bag is to be carried. Here is Caitlin and Grace who were over for a visit this afternoon too. Notice Caitlin's hair. She braided it herself. She's going to be a hair dresser, you know! Grace wants to be a veterinarian. Mitchell said he wants to help animals too. I've been using my Juki TL98Q daily and I've tried lots of things. I really like it. The needle threader is awesome. It never misses. Also I love the thread cutter. It's second nature now. It never misses picking up the bobbin thread when I restart sewing. This is so nice. It's now my main machine. I've used my Pfaff for a couple of small zig zag and embroidery projects. Now I want to try my hand at piecing on the Juki. The Juki came with a 1/4" foot which is great for strip piecing because it has a bar on the side which feeds quickly and the bar limits how far the fabric will go over. For piecing, I'm a pinner and I pin my fabric pieces to death. I need a 1/4" foot that doesn't have the bar on the side so that I can leave the pin in the fabric right up to the moment a stitch is taken. You can see in this picture that my 1/4" mark is clearly marked and I can use the Juki standard sewing foot for 1/4 inch seams but a foot with marks is really what I want. I've tried 2 different high shank 1/4 inch feet on my new Juki. Both are close but not quite there. The needle is not centered over the foot. Actually the foot is covering part of the hole in the needle plate. Do any of you Juki TL98Q users use a 1/4 foot without a sidebar? Today, I had a to-do list a mile long. Mitchell came over to help me do these gazillion things. We dropped a paper off at the bank. We dropped some weddingy things off to Stephanie at City Hall. Mitchell had never been in there before. We went to Scoop and Save to buy some special vacation lunch things and then on to Moores where they fitted Mitchell for his fancy clothes that he'll wear at the wedding. While driving around at all our stops, Mitchell said "I love a rainy day!!" When we got home we made waffles for lunch. 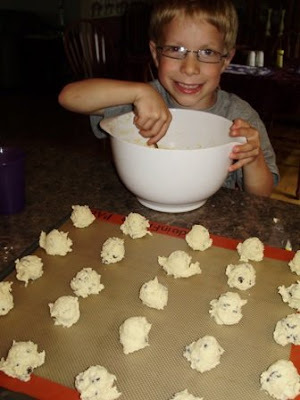 Then we made chocolate chip cookies together and Mitchell licked the bowl and the beaters all by himself. He never had to share with anyone!! 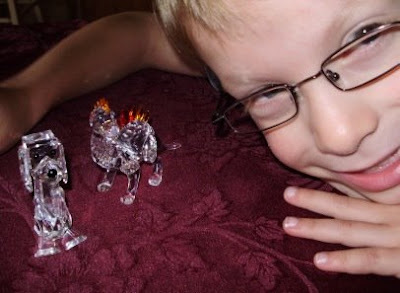 He really wanted me to show you these special Swarovski figurines. One is called Dino and the other is called FiFi. They are my entire crystal collection. When he grows up and gets married, these will be his. He likes to look at them and admire their special glimmer. FiFi, the poodle is about 30 years old and I got her when I lived in Europe. 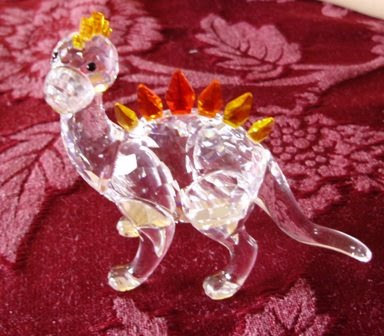 I just got Dino last year at the Duty Free shop. See the new colors that Swarovski incorporate into their crystal. I might buy another figurine next one year to make 3 in the collection. We'll see if they still have them at the duty free store. Mitchell says when has kids, he's never going to let them touch them. And the final thing we did together today was write this blog. It was a great rainy day. Thanks for all your help Mitchell. While it was drizzly and cloudy for the weekend, it was still great to spend a relaxing weekend at my sisters house in Nova Scotia. We did small projects her daughters wedding. While I did some hand sewing, my sister covered an old chair that has been our family for about 50 years. 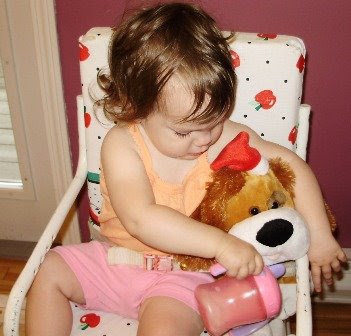 We have pictures of us as babies on that chair. She's going to blog about it and will probably tell you about the Rocket Richard connection to it. It's a sweet chair and I would never have had the courage to upholster it, but she did and it looks like new. Stay tuned to my sidebar to see an update about the chair at Donna's blog soon. So we're home now, back in sunny NB (not) and I have a fun new to-do list as we head into the final stretch before the wedding which is in about 3 weeks. I had intended on losing 20 lbs before the wedding, but I don't think that's going to happen so it's time to start looking for a nice dress to wear. Last week I also started some small selvage projects which I will get back to and finish today. I'll take a picture and show you later this afternoon. Boy, it's a good thing I really love my sister. She requested a casserole carrier quite some time ago. "Not a round one", she said, "I want one to carry my 9 x 13 pan". So, I have had the special fabric for almost a year now, and it's been sitting in the casserole pan on my sewing table all that time. I didn't quite have the right pattern to make the carrier, and and looked at free pattern after free pattern . None of them was what I was looking for. 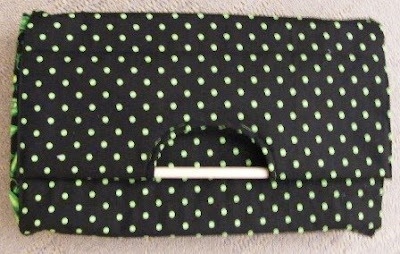 So after making the little round casserole carrier yesterday, I decided tackle the task of making my sister's rectangle casserole carrier. I spread the fabric out and set the dish on it. My brain was doing 10 calculations at once, then my plan of action was being developed as I was folding and unfolding the fabric around the dish. I've been measuring, sewing, fitting and tweaking this design all day. It's modeled something like this one that is a free pattern and this one too. Except the one I made is simply made from 2 layers of quilters cotton and it's not stuffed with batting. 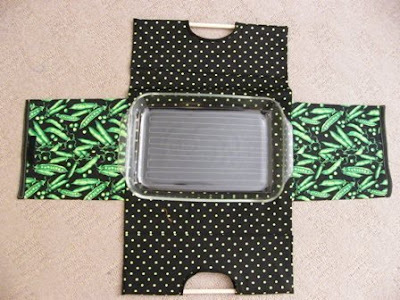 I did make a plain black quilted hot pad that sits under the dish. It's hard to see, but I just quilted straight lines back and forth on it. Do you see it? The fabric was chosen because my sister hates peas but loves "pea" inspired things. It's funny, I don't like carrots and she doesn't like peas. Back when we were kids, those were the only vegetables Mom served. So can you imagine the fights at the dinner table. "Eat your Peas!" one night. The next was "Eat your Carrots!". So it's done. Yippee. I'll be surprising my sister with it this weekend. For those who asked, I came across this free tutorial to make a round casserole carrier similar to I made earlier this week. It's very close to the one I made without a pattern. 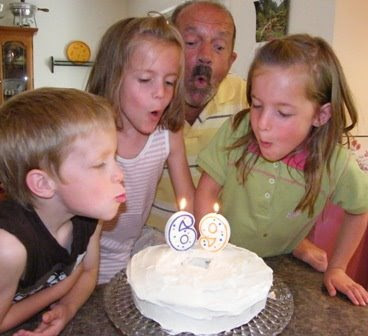 Today Grampie, my hubby, celebrated his 69th birthday. He had a great day. We went for a nice walk along the trail this morning. 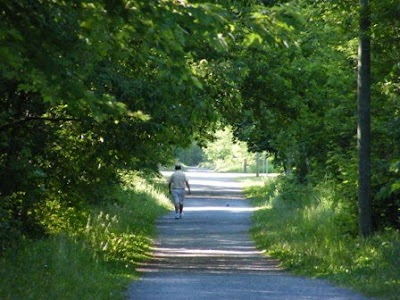 We're so lucky to have these old converted train track trails in our area. We both either walk or run on them every day. And what a gorgeous day this is. This afternoon Mitchell, Grace and Caitlin came over to help him blow out his candles. Before the kids went in to look at his cake, I asked Mitchell "How many candles on Grampie's cake today". Mitchell replied, "sixty nine". I said, heavens no, if there were that many, we'd need the fire department to help blow them out. There's only 2 candles. He looked perplexed and then ran in the house to see why! Grampie wanted home made carrot cake, so that's what I made him. With cream cheese frosting too. Here is my mother's casserole recipe. I used to make it all the time, not just to take to pot lucks, but to serve at home. I called it Gramma's Rice. Here it is. In later years, I tend to just put chopped onions instead of the onion soup mix so it has less salt and I use a bit less than the 1/4 cup oil that is called for. It's yummy just the same. It's good hot or cold. Bake in a covered casserole dish at 350 degrees for 1 hours then turn off the oven. I leave the casserole in the oven for another half an hour. Another recipe my mother used to make was Dirty Macaroni. Now I bet you'll be curious as to what that is, won't you. Within a couple of weeks, I'll dig out the recipe and make some so that I have a picture to go along with the recipe. I made this little round casserole carrier for a soon to be bride. It's a great summer theme since it has ladybugs all over it. It fits my older round Pyrex dish perfectly, so I'll have to go to the store to to see if I can find brand new pretty one for her in a similar size. I needed a little embroidery fix today, so after spending an hour looking around at designs, I ended up with this sweet little single color ladybug. It is on the center inside. A surprise bug you might say. I like this carrier design because you can flip it over and use it as a pot mat to protect your counter top from hot pots. 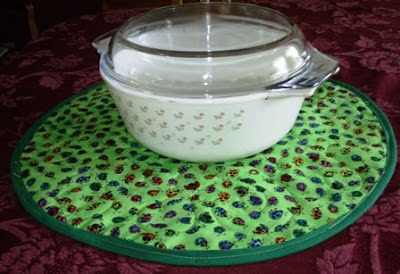 I think I'll include a couple recipes for a couple of my favorite casserole dishes that I like to take to a pot luck. Gramma's baked rice is a favorite. I'll have to put some thought into a couple of others. 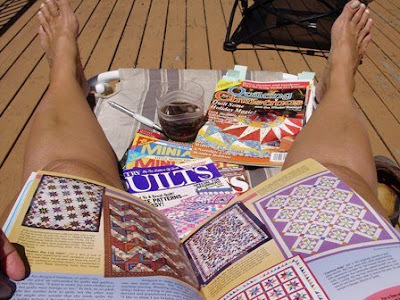 This weekend I took a dozen 1999, 2000, 2001 quilt magazines to the cottage. I need to get rid of some stuff. So I thought I'd have one last look through them to see if it was OK to recycle. Well, what a fun way to spend the afternoon on the deck. So what did not appeal to me 10 years ago, sure looks good to me now. There's at least one or 2 projects out of each magazine that I want to make. The end result, no recycling of these magazines. They all have page marks with notes on them and they'll be returning to my list of "want to make" pile. The good thing is that some of the projects are small and I can quickly make up a kit which can be sewn together at a later time. It's so fun to watch the gardens at the cottage this time of year. It's the first thing I do before even going in the cottage each week. I walk around and inspect what's blooming. 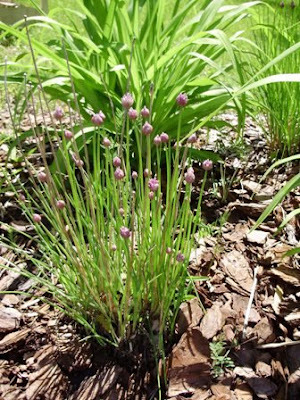 I'm happy to report that my 4 year old chives, have these beautiful purple blooms for the very first time. My larger garlic chives have no blooms in the foreseeable future, for the very first time. How weird is that. My pole beans and morning glories are up thanks to some rain earlier this week. 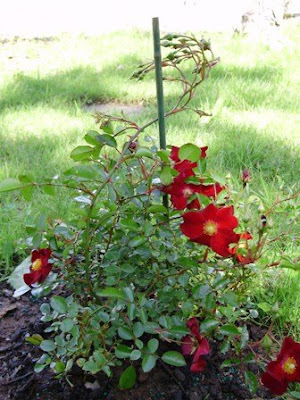 My rose bush is filled with blooms and more than a hundred small buds. It's sweet. There was a long branch strung out on the ground, so we staked it up. Looks like the branch is posing like "the Thinker". Do you see it? My hosta gardens are doing fabulous. The hostas that my friend Linda H. gave me, are all doing wonderful. Actually they're all bigger than the ones I've put in the last few years. No slugs yet, but it's early. We've got the bait and eggshells all ready for when they do appear. My sister, the gardener, is coming up next weekend, and I'll have her inspect them for me. Every once in a while, I'll see a project that stops me in my tracks. 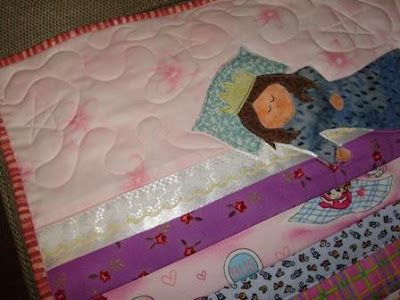 I saw this Princess and the Pea quilt on the Moda blog last week and thought, how perfect. I had to make it. 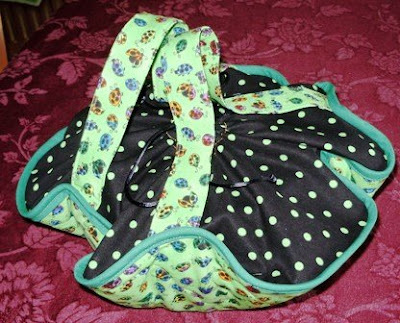 The pattern is by Angela Yosten and the tutorial can be found on her blog here. I actually saw this on the Moda blog. The quilt I made was only 20" x 30". I also did a plain binding instead of a ruffle. I just happen to know a little girl who this would be perfect for. She's just coming into the age where she'll want everyone to read her stories. You'll notice that there are 20 different mattresses. Earlier this week when laying out all the pieces, I only had 14 mattresses. But Caitlin was over for a visit, and she knew the story in fine detail and said that there are 20 mattresses not 14. She also found me a green button out of my button box and was very specific on where it should go. Do you see it? That is the perfect placement for the button. I did make sure to put a frilly silky sheet on top of the mattresses for this little princess to sleep on. It's wedding fabric and the piece of lace is out of a box of lace that came from my mother's craft room. I'm still getting used to my Juki and this quilt was made entirely on it. I used the walking foot and enjoyed how quick that the parallel lines were quilted. I did practice my free motion by stitching the name of the story on the single white mattress. I didn't want the writing to be invisible, but I didn't want it to stand out like a sore thumb either. So I used light pink thread. I like it. I really enjoyed making this project. Absolutely everything I needed came from my stash. Last week at our Friday Girls meeting, our hostess made a healthy lemon poppy seed loaf from the Eat Shrink and be Merry cookbook. I have their other 2 cookbooks (on loan from my sister). Anyway, this lemon loaf recipe was delicious and I only had a small slice. I should have had another and I've been longing for more ever since last week. 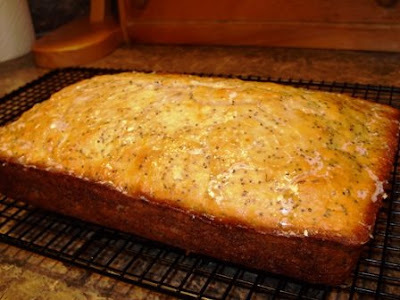 Since I don't have that cookbook (yet) and the Friday girl hostess is gone on a vacation, I turned to the Internet to find a healthy lemon poppy seed loaf recipe. I found this recipe on the Superstore's President's Choice website . I has a bit of whole wheat flour and yogurt as some of the ingredients. So it must be healthy right? Well I made it. It was tasty. I still want to try the other one and compare. So I cut the loaf in half and put half in the freezer, and hopefully, my hubby will help me eat the other half. I'm hoping that will will squelch my lemon loaf craving, at least temporarily. Now, I'm looking for more recipes to use up some poppy seeds. Got any suggestions? 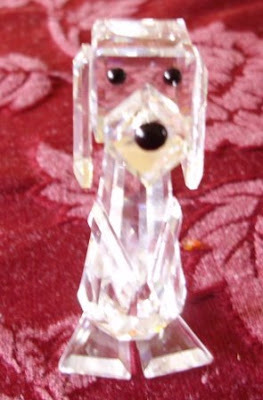 I was a blog contest winner at RibbonSmyth last month. 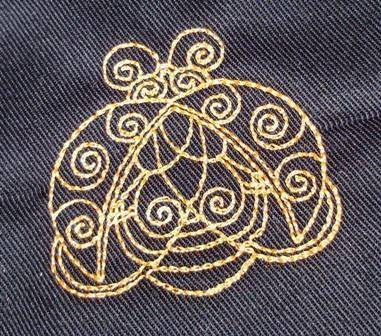 RibbonSmyth is a great Crazy Quilter's resource for silk ribbons, charms, fabrics, kits etc. When I took my CQ class last year from LindaH, RibbonSmyth was recommended as one of her preferred online stores. 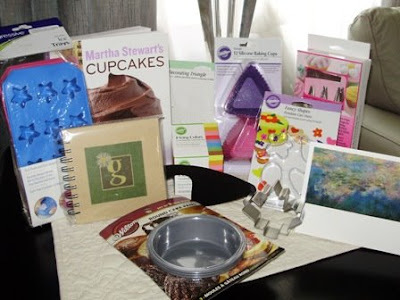 I love crazy quilting because you can pack a lot of great things into a neat little package. I mean that in a few ways. 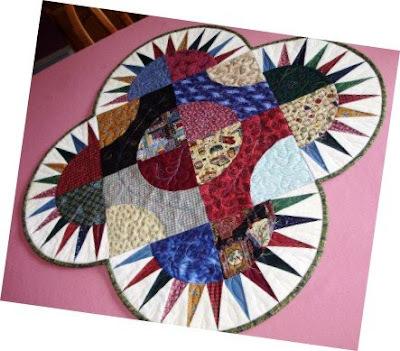 If you are getting to a stage that you want to work on meaningful projects, but don't want to store any more bulky queen size quilts, you can work for hours on a CQ project, and the project is small and contained to a small area as well. Also, when you purchase CQ supplies, they arrive in a small package but pack a big punch of excitement. For example, I received my gift pack from RibbonSmyth yesterday and just look how much was in this innocent looking letter size envelope. 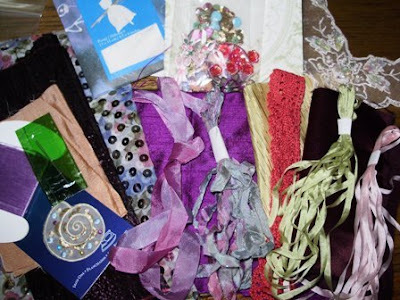 In my gift pack, there are pieces of fancy fabrics in purples, lavenders, green. There is also a bit of what looks like hand made lace, in coral color, some fancy sequence fabric, an organza shell applique, silk ribbons, stitching floss, and a much large eye needle. There is also a blank stitchable greeting card and a little kit of charms, buttons, sequence to stitch an oversize button. Great to do a mini collage on. How fun. I'm all revved up to dive in, but I don't know where to start. I might have to call on my CQ teacher friend for help! If you want to get in on the fun, go to the RibbonSmyth Blog and sign up for the June draw. Also visit her website, where you'll find many things including free projects to get you started. Many thanks RibbonSmyth. You've made my day..
Today, hubby and I took a tour at the Charlotte Street Art Center. 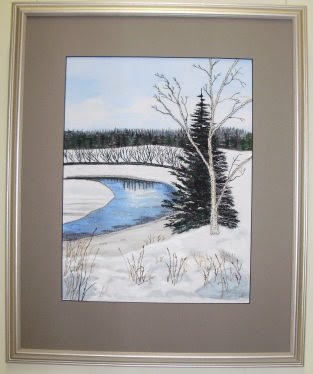 It was an exhibit of Kathy Tidswell, a nationally recognized fibre artist. Her speciality is thread painting. She won an award by CQA for Teacher of the Year and teaches her techniques all over. She is sharing her talent this summer in a number of thread painting classes that she is teaching in the EdVentures program. There were over 30 pieces in this exhibit, but I'll only show you a few. To get the true sense of how beautiful the pieces are, you need to visit in person. My camera just can't do them justice. I've seen this first piece before in the NB Lt. Governor's gallery. She calls it the Bank Machine Blues. 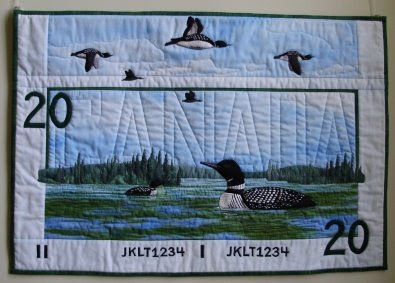 I love how she cleverly used the stitching to put the "CANADA" on the note. I really love the play on words and the oversize money. 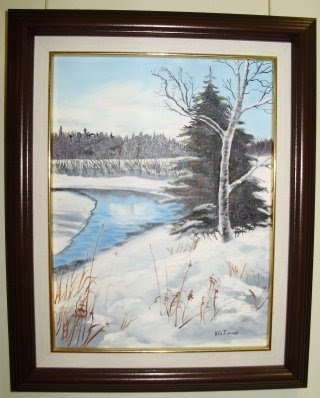 The next three pictures are of a landscape scene painting that Kathy oil painted herself. 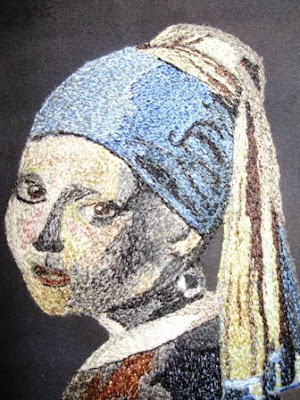 Then from her own paining, she stitched a thread painting depicting the same scene from her own oil paining. 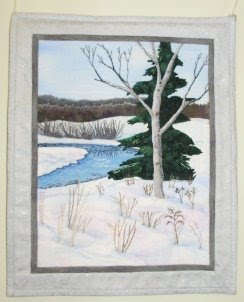 Then the third picture is a quilt that she made and used the same painting as the inspiration. She used and applique technique. I thought it was cool to see the same picture used in all three types of her hand/machine working styles. It made for a really interesting display. The final one is my absolute favorite. It's based on Vermeer's "The Girl with the Pearl Earring". I listened to this book a couple of years ago I looked for the painting on the Internet after finishing the book and it's exactly as I had pictured it in my mind as I listened to the audio. I saw another of Vermeer's work at the New York Metropolitan Museum of Art. 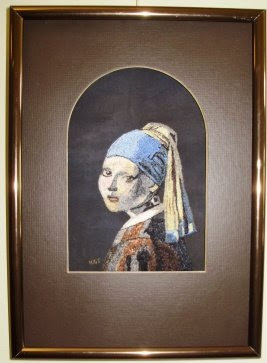 The stitch work on this girl is stunning and the frame style really shows off the work. It's absolutely beautiful. It was the favorite of my hubby too. This was a lovely exhibition Kathy. Congratulations. This week, I have a few projects that I'm machine quilting on my new Juki. This is my Maritime Beauty from the class that I took in April from Karen at Sew Karenly. I finished this workshop piece quite quickly but was waiting for my new Juki to use it as my very first machine quilting test. So, yesterday I finished machine quilting it. I took the opportunity to try a binding technique that Judy from Patchwork times demonstrated here. She also has subsequent hints on her blog, so if you're going to try this, be sure to read all her posts pertaining to binding. It's all good info. 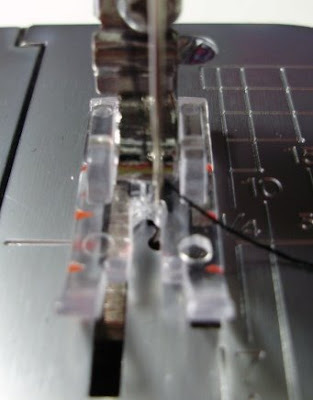 The technique requires a good bit of pinning and preparation, but then the stitching takes minutes. This 30" table center piece, even with the curved sides took about 15 minutes to pin and about 5 minutes to sew. To do this by hand, would have easily taken me a few hours. Judy recommends pinning quite close together. And she recommends stitching in the ditch with thread the same color as the background fabric. See how it blends in. It's hardly noticeable. In the bobbin, if you use thread the same color as the binding, you'll hardly notice the bottom thread also. Back to free motion on my new Juki, I found it quite nice to stitch with, although, it does go fast. I have to learn to be smoother with my movements. I thought free motion was very "free"
but I am discovering that there is quite a bit of planning involved. I started in the center and tried a few different techniques as I moved to the outer edges. I used a small spool of coats variegated thread that I had no idea how cute it would be. It shows up quite nice on the black fabric piece. The fabrics in this piece were from a bag of scraps that I bought at an auction our guild had a number of years ago. I have another rectangle shaped table runner that I'm finishing made from the same fabrics. The rest of the scraps are going into the trash. They're really not that nice. I enjoyed making my practice pieces from them and these pieces are going to the cottage. I'll make new projects out of nicer colors for the house. I hope this weekend was just the beginning of more sunny weekends at the cottage. Weather really makes a big difference. We took in way too much sun. Baby Aurora enjoyed all the fresh air and her freedom on the enclosed deck. 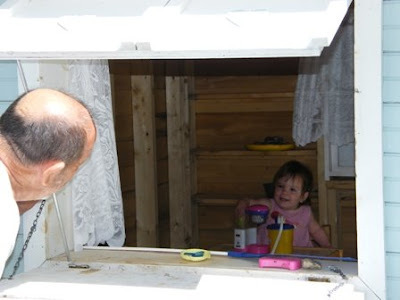 Here she is in the kids cottage, preparing a yummy mucky treat for Grampie. 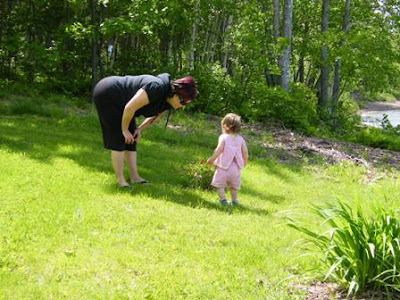 Aurora and her mama are admiring the little red bush roses that are coming out now on the plant that Julie and Sean gave me last month. It has a ton of little buds on it and I hope they don't all flower this week while we're in town. My other plants are all coming along nicely too. My sister would have been proud of me. I weeded twice this weekend. Each time, the bugs got bad but just with that little effort, the gardens look a lot better. I've been awake half the night. I've got 2 things on my mind. For the past 2 weeks, I've been taking physio for my bum knee. I've also been preparing to re start my running program under the supervision of my physiotherapist. I've been huffing it on the elliptical, to strengthen my wind. I've been conditioning my knee with leg presses, stretches and ice. And today is the day, that I am to start running again. I was fully awake at 4:30am this morning. It was light out. Though, too early to go out for my run. I like to run when other runners are out just in case I fall or need help. 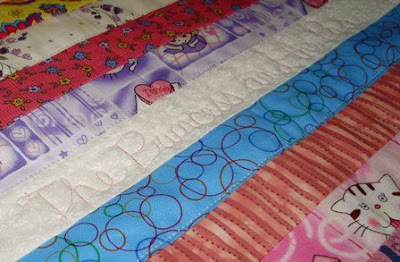 My thoughts turn to sewing a little storybook quilt that I'm making for baby Aurora. I have it spread out on my ironing board. I need a piece of light light blue fabric. As I lie awake, I'm mentally going through my fabric stash. I think I have a piece of light light pinky white. I'm thinking about the construction of this little quilt. I look at the clock. it's now 5:30. My thoughts go back to preparing for my run. You would think I was going in a marathon or something... But I am so excited to do this, it's been almost a year since I've had a successful run. It's just before 6 am. I fling the covers off, and I know exactly where my running duds are, my ironman watch, my socks, sneakers, ipod, my long sleeve running shirt cause it's ZERO degrees out. No need to do hair, teeth or any of that stuff. Within 8 minutes I'm out the door. It was a beautiful sunny morning on the trail. The river water was still. There were rowers out in the water, runners on the bridge. I was impressed with my wind and sweating is wonderful. The best part is, it's only 7:30 am and there's lots more left of this great day. 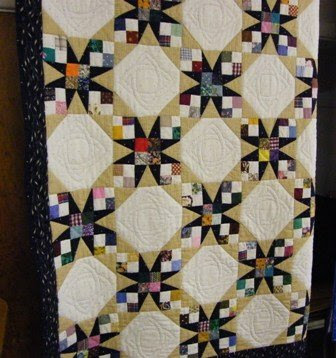 In yesterday's post, I showed a great quilt made from a simple block. Or I should say it looks simple. I had a little hodge podge of 1.5 inch strips on my cutting table, so without anything else planned for today, I thought I'd try to make a small card table topper cloth. 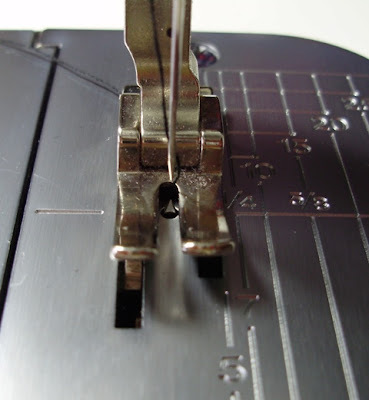 I was using my new Juki TL98Q for sewing strips together. I have on order from my dealer, a 1/4 inch foot without a side on it but for today, I used the 1/4 inch foot that has the side guide. I was quickly getting through the first set of sewing strips together. I ironed, and sewed each pair of strips together again and ironed. I had all that done in less than an hour. When I measured the width of the strips, I was surprised to see that it was only 4.25". My friend Lee pointed out in a comment on yesterday's blog, the math told me that it should be 4.5" wide. I quickly realized that my problem is that I didn't do a 1/4 inch test on my new machine. I'm surmising that with each of the 3 seams in the small blocks, my1/4 seam was just a few threads too big. Compound it over 3 seams, and that's where my other 1/4 inch went. I guess this little project has become my 1/4 inch test. So, after sewing the 4 little blocks together, the finished block is only 8". So I'll finish this little topper by using a slightly less than 1/4 inch to see if I can keep the illusion of equal size strips. Tomorrow I'll add the side triangles, sew the blocks together and add a couple of small borders. I'm planning to machine quilt on the new Juki on Thursday. Stay tuned to see a finished topper later this week. I will do a "real" 1/4" test when I get my new foot. 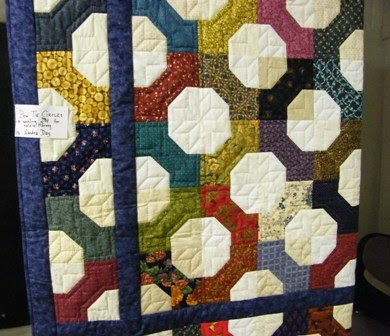 Last Friday, the Friday girls and I attended the annual Maugerville Quilt show and tea. Maugerville is a local service district outside the city of Fredericton. This show had a large amount of scrap quilts. 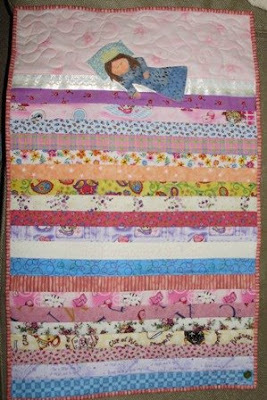 Anyone who knows me, knows that I love scrap quilts. I make planned scrappy quilts most of the time. 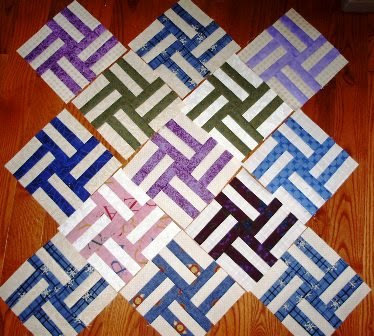 After looking at all the quilts, the Friday girls sat and had a great cup of coffee and a home made square. We discussed which quilts we would pick as our entries for the Viewers choice ribbon. We couldn't decide. After finishing our treat, we had to go around again, and have a second look at all the quilts before we each personally made our final picks. I realize now that I should have written the names of the quilts and quilt makers down so I could share with you. 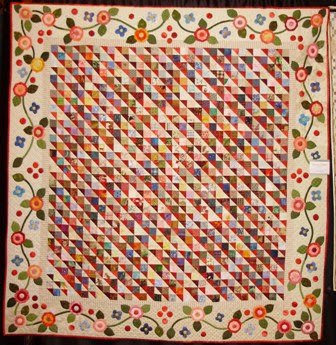 Here are some photos the quilts that I liked the best. The name of this quilt is on the tip of my tongue. Could it be the Tennissee Waltz. I like the dark points of the stars, and I like the fact that they're all the same fabric. This is truly my style, and I'm going to make up a new quilt category.. Semi-Scrappy... and call that my personal style of quilting. Again, how cute is this. I think this would be a great way to use those left over 1.5" * 21" darker strips that I have on my sewing table right now. All I need is a bunch of light strips to go with them. And as I look at this, I think each of the blocks would be made up of four 5 inch blocks. So I think there would be very little waste. I like that. I've seen this pattern several times and I always say, "I've got to make this". I'm sure it's called, the split nine patch. I think I may even have this pattern.. somewhere. I need to start collecting red fabrics before I can even consider doing this. Or all the purples that I've been collecting could be transformed... hmm... now, I think that's a great idea if I do say so myself. 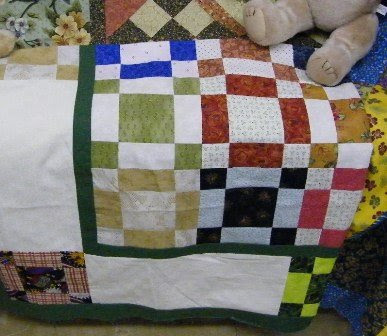 Don't you think this bow tie quilt would look great on one of the beds at the cottage. For me, this would be a true scrap quilt since I have lots and lots of nice unique small pieces of fabric. Some old, some new. I've seen this pattern a few times, and I love that it speaks to me in a math sort of way. I think it's called Puss in the Corner. I spoke to Sandra who made this little card table cover size quilt and she said it was made with left over blocks from a big quilt. That gave me the idea to make a table cloth for our card table. Great show and very tasty goodies to eat and drink while there. It was nice to have the bake table too. I bought the Oatmeal molasses bread that was baked in the Apple juice cans. Hubby liked it too. Yummy.